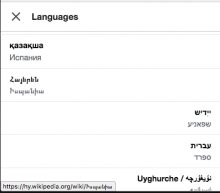 Items in the language list are in a mix of RTL and LTR languages. This makes the list somewhat strangely aligned. A dir attribute needs to be added to each language item. Currently the API does not support this but we can use an array to determine RTL given the number of RTL languages that exist. We'll use a frontend library and submit a patch in parallel to get this into core. See ongoing conversation in https://gerrit.wikimedia.org/r/415176, T189036 and associated patchsets. All other languages should be considered ltr. RTL languages should appear right aligned. LTR left aligned. When done pass to Nirzar for sign off. What are the steps or platform required to see this? A screenshot perhaps? Another imaginable possibility is to resolve it through https://phabricator.wikimedia.org/T78337 . It also makes more sense because it's about languages and not sites. Amire80 added a project: I18n. Centering it makes sense - that's how language lists are shown on an iPhone, for example. here's a screen from iPhone. Use the current language as base language and translate all other language names into that language. so for example. 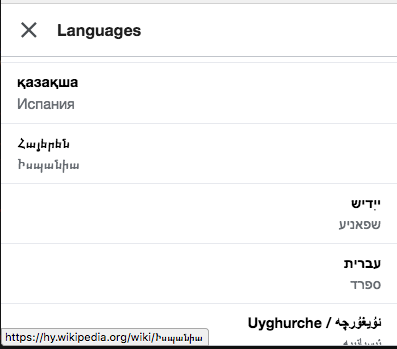 if you current project language is Hebrew, and you are switching languages, the whole language list will use Hebrew script and will be RTL. that way it's even easier for a Hebrew speaking person to read all other language names. JKatzWMF added a parent task: T137932: [EPIC] Mobile language switching improvement work II. @JKatzWMF i think the amount of work needs to be done for option 2 above is a lot. We can estimate it but my feelings it's a whole project on its own. I think we should go with option 1 unless there are any strong objections. also this shouldn't be a blocker in my opinion since the title says "looks strange"
@Nirzar works for me. If @dr0ptp4kt agrees, let's remove as a blocker. I agree - option 1 - be consistent. OR option 0 - don't introduce extra scope. 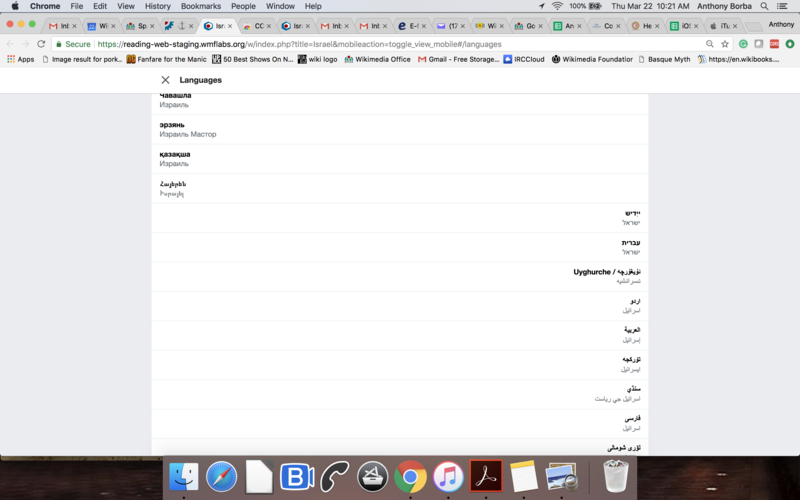 Presently, the mobile language switcher uses the directionality of the wiki, meaning: if the wiki language is LTR the list is left aligned and if it's RTL it's right aligned. MBinder_WMF edited projects, added Readers-Web-Backlog (Design); removed Readers-Web-Backlog. • Jdlrobson merged a task: T188233: Article titles in the language list lack the lang and dir attributes, and autonyms lack the dir attributes. • Jdlrobson added a subscriber: Aklapper. • Jdlrobson moved this task from 2017-18 Q3 to Upcoming on the Readers-Web-Backlog board. Our estimates ranged from 2-5. It seems like more clarity on T74153 would be helpful. I'll do that. ovasileva added a project: Readers-Web-Kanbanana-Board-Old. • Jdlrobson moved this task from Upcoming to 2017-18 Q3 on the Readers-Web-Backlog board. I will continue working on the parent tasks to render the JS array unnecessary but we can push ahead and review this. • Jdlrobson reassigned this task from • Jdlrobson to ABorbaWMF. • Jdlrobson added a subscriber: ABorbaWMF. @ABorbaWMF I've added instructions for how to test!